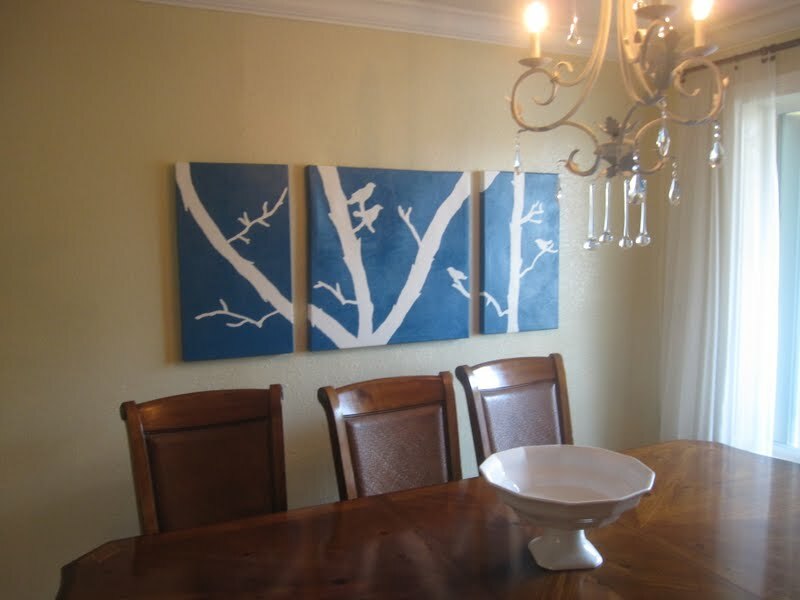 So after hanging the birds and branches painting last week, at my friends house, we felt that her current lighting was just not fitting in with the look of the paintings. 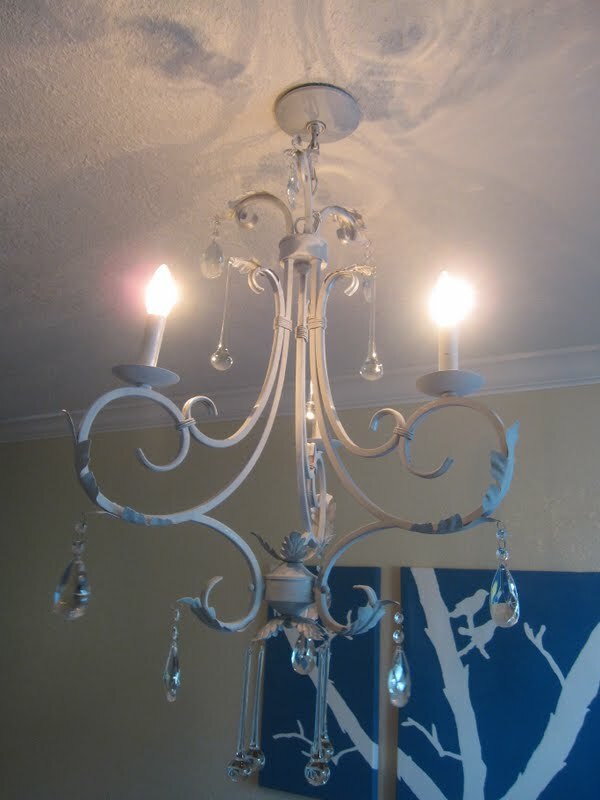 ﻿A few years ago, she bought a chandelier online for about $40.00. When it arrived it was not really what she had anticipated. It was a little too brassy and antique looking for her house. So it's been sitting in her garage ever since. We spray painted it a metallic silver. Then we used the same technique that I used on my sister's chandelier. We used a tiny amount of Annie Sloan's chalk paint mixed with about an inch of water and just repeatedly brushed it on the chandelier. It took away the sharpness of the silver spray paint and gave it a bit of a grayish, whitish finish with a little silver shining through. 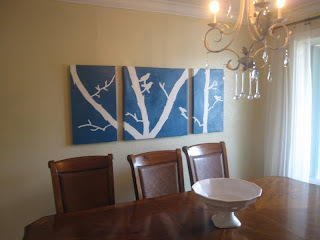 Here it is hanging in her dining room. 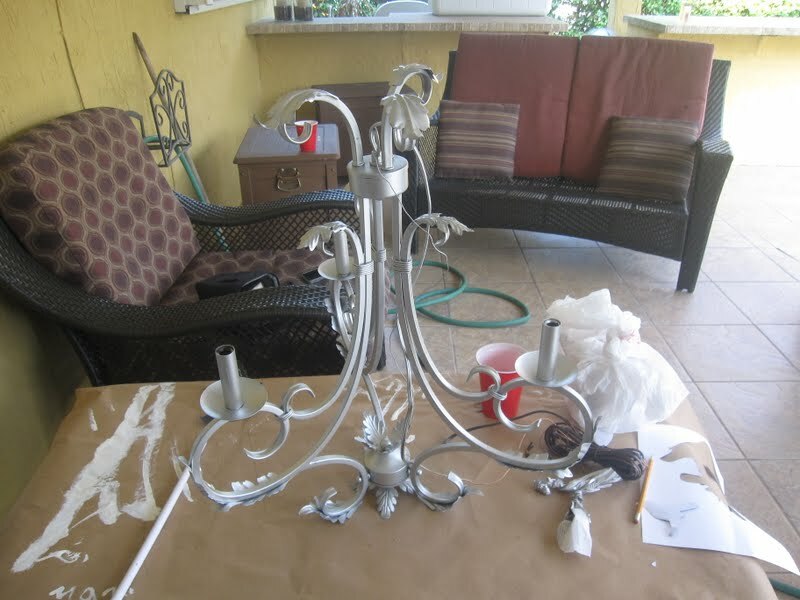 It turned into a total mini makeover and completely changed the feel of her dining room. I love it! SO SO SO much better! Beautiful!!!! Wow. 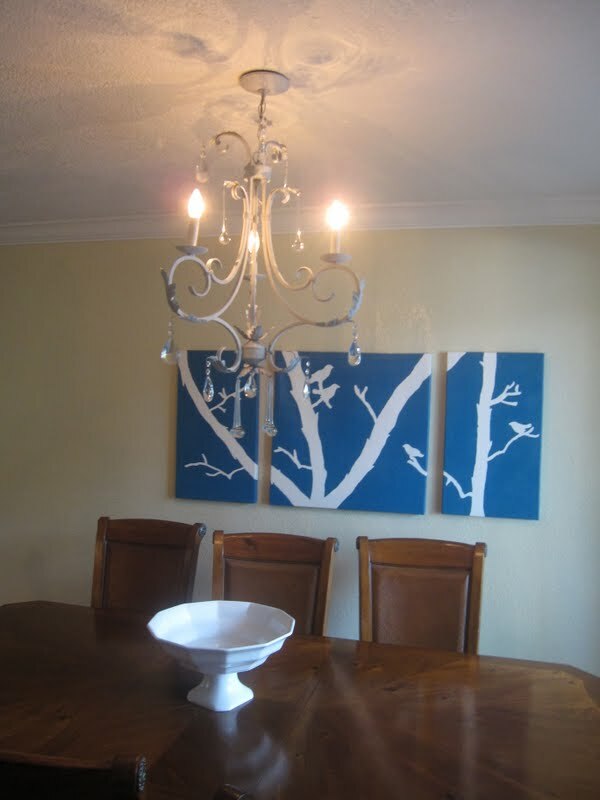 That chandelier has a much lighter feel and allows the eye continue on to the painting. Good call! the repainted light (with the new DIY art) gives it such a lighter feel! Beautiful!!! I love it. My dining room is such a work in progress and I need a new chandelier!! 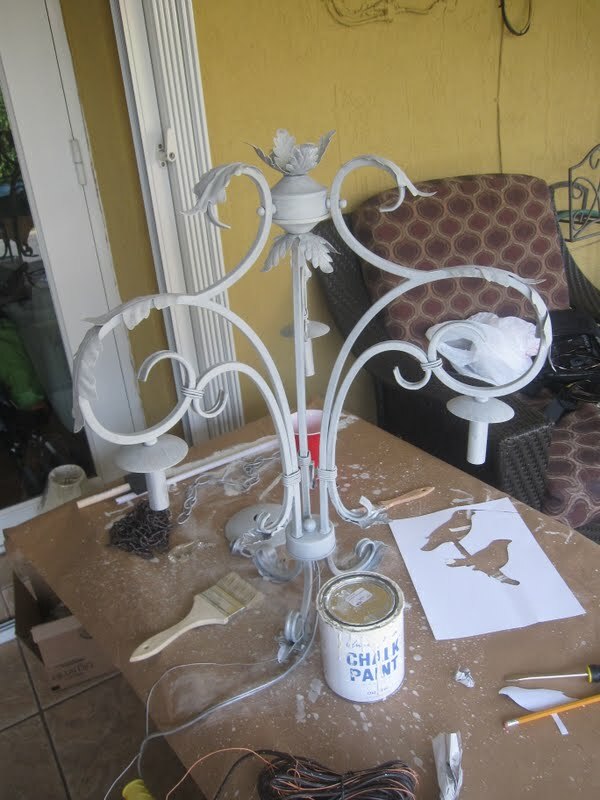 My favorite chandelier is the OCHRE Pear Chandelier and I need to figure out a DIY Replicate because the $3000 is not in the budget! Great makeover! 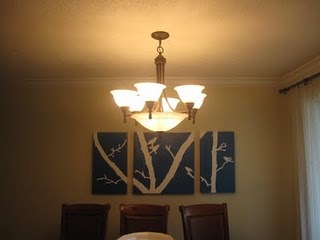 The whole room looks lighter and brighter with the new chandelier and painting. It looks beautiful! It looks like a different room. I love the revamp! It looks so light and delicate now! Oh my gosh, what a great change! Love it! It looks WAY more chic and now!! :) nice work! The chandy and artwork looks great. Very good improvements for updating. That is a great transformation after only a few small changes! What an inspiration! Thanks for sharing! It looks beautiful! 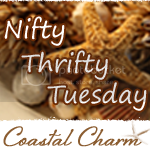 Thanks for linking up to the Creative Bloggers' Party & Hop.